The urban sprawl that makes up modern Kathmandu is in fact two cities, Patan and Kathmandu. Overnight at hotel. This morning you will be taken for a visit of the Hindu culture in Nepal, Pashupatinath. This is the place where holy saddhus pray and cremations on the Bagmati River are carried out. 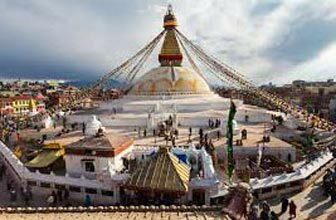 We then continue to the holiest shrine for the Buddhist culture in Nepal, Bouddhanath, with its large stupa, this is the place where all devout Buddhists come for a pilgrimage. 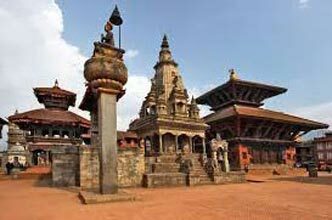 This morning you will be taken take you for a visit to Patan. Also known as Lalitpur , the city of beauty is separated from Kathmandu only by the Bagmati River and is the second largest town in the valley. Lalitpur is fragmented from other cities due to its substantive architectural ancient masterpieces. Patan's central Durbar Square is absolutely packed with temples: Its an architectural center point with a far greater concentration of temples per sq. meter than in Kathamandu or Bhaktapur. Within the city also lies the Tibetan refugee center, home to most of the valley's Tibetan population. While technically refugees, the Tibetans are some of the wealthiest people in the valley because of the carpet industry they operate. For those looking to bring home a fine Tibetan carpet, this is the place to shop. 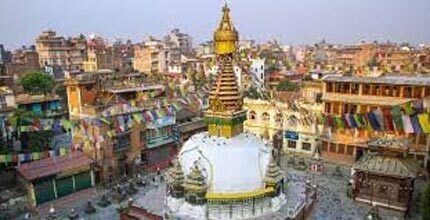 You will then go to Swayambhunath the golden spire of the 5th-century Swayambhu stupa is adorned with a colorful fluttering of prayer flags; it crowns a hill overlooking the Kathmandu Valley and offers fantastic views over the city of Kathmandu. Swayambhunath is one of the most recognizable symbols in Nepal and the painted eyes of Buddha watch all who ascend the worn stone steps. Excursion trip to Nagarkot. Nagarkot is situated 32 kilometers, 1.5 hrs drive east of Kathmandu at an altitude of 2,175 meters. The panoramic view of the major peaks including. This place is also famous for viewing sunrise and sunset.